This recipe is a great one for a crowd. It is made with gluten-free pasta and is loaded with veggies. Make this one for your Labor Day crowd or bring it along. It has staying power outside because there is no dairy in it. Put a large pot of water on high and cook pasta according to package instructions. Rinse and dry parsley. Chop. Meanwhile, dice red and orange bell pepper. Drain and rinse black beans and drain corn. Drain pasta in colander. Put 1/4 cup of oil in empty pan. Put pasta back into the pan and lightly toss. Add bag of frozen peas and stir gently. Add beans, corn and both peppers. Stir gently. Add remaining 1/4 cup oil and 1/2 cup vinegar. Stir gently. Add parsley. Stir Gently. 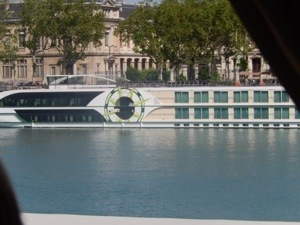 I just returned from a dream vacation, Paris to Lyon and a cruise on the Rhone River. I ate new foods, tasted wonderful wine and saw monuments and lavender fields. This was a “check this off the list” sort of trip. 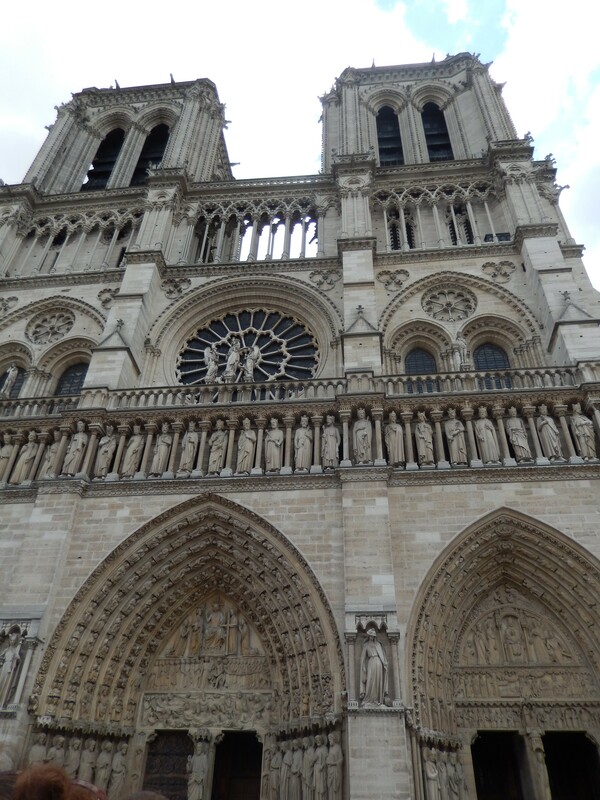 Paris was a wonderful city and I could stay for months and never see all there is to see. 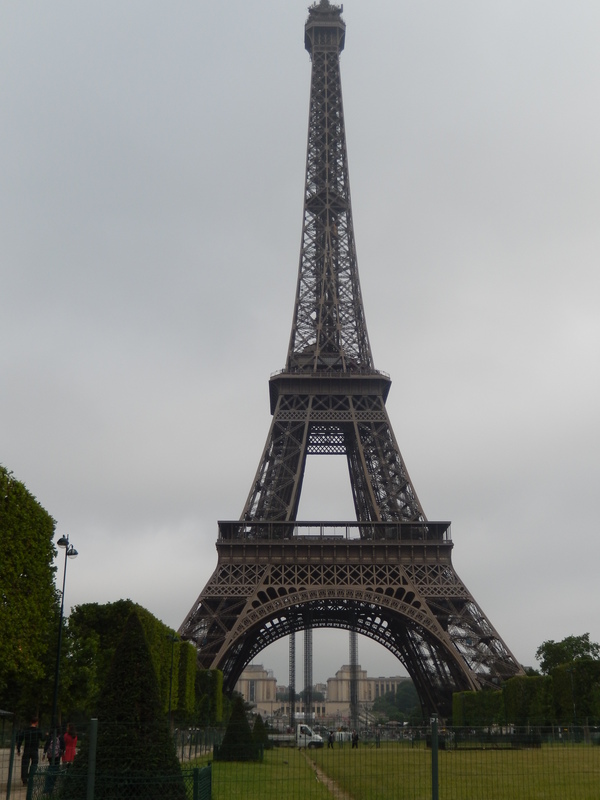 We saw the Eiffel Tower from a distance, up close and inside. It takes on a whole new look at night with the lights reflecting the steel in the night time sky. We climbed to the top of the Arc de Triumphe – all 284 stairs! I ate an interesting ham sandwich called a Croque-Madame. 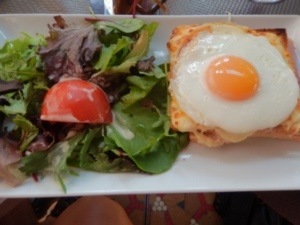 It is a Croque-Monsieur (a grilled ham sandwich with the ham inside the bread and the cheese on top)!with an egg on top. Madame! Get it? Egg on top? It cracked me up and was delicious. 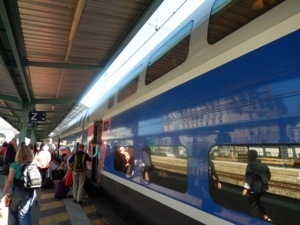 I went on a high speed train called the TGV from Paris to Lyon and boarded the Swiss Emerald for a Tauck cruise down the Rhône River. I cannot say enough about that company. When I first started framing this post all I could think about was what I did not see while in Paris. I didn’t see Montmartre, Sacré-Cœur, the Moulin Rouge or Musée d’Orsay. I didn’t see the Luxembourg Gardens, Pompidou Centre or the Mona Lisa. 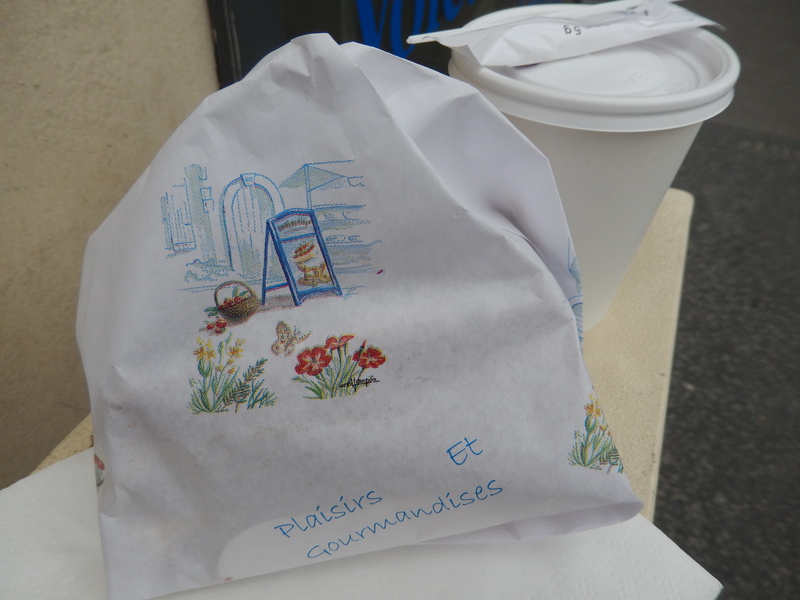 Tauck gave us the option to go on a coach bus “orientation” tour or a walking tour of the Marais neighborhood. Our group of four decided a few weeks before over dinner at our house that we wanted to go on the coach to cover as much ground as possible. It was a good choice for us as we were able to go out for a few photo ops near the Eiffel Tower and opt off the bus near the Arc de Triumphe. We headed for the tunnel and noticed no one in line for the stairs. Just a few minutes later we began the 284 stairs to the top. A challenge but we all did without any negative consequences. Here is a picture from the top looking down the spiral staircase. Cool, no? This is a look at the city from the top of the Arc. It was so totally worth the climb. Then it was a walk down the Champs-Elysees to Cafe George V for lunch. we learned that the cafe section on the street is for smokers, and there are a lot of smokers in France. A shocking amount, to be honest. And, not just older people but young folks smoking everywhere. The sandwich has ham inside and is grilled to crispy perfection. The cheese is put on top and broiled to make it brown and bubbly. The “female” madame version has an egg on it. I absolutely loved it. I am going to make these at home on a cold winter day. Next we were off to the Metro, an easy way to navigate Paris. It is interesting to see the doors that cover the track and only open when the train is at the station. They open quickly…and close quickly. Fortunately the trains come every few minutes. Jim, pictured here with his wife Debbie is not a coffee drinker. His caffine delivery system is Coca Cola. Not Pepsi. Coke. No problem since I don’t think I ever saw Pepsi in the country. He was jonesing for a Coke and spotted a vending machine. A few Euro coins later the train stopped, unloaded and reloaded just before he finished his transaction. The look on his face as the train, with my husband and I on it and his wife pointing was priceless. Good thing the trains come every few minutes. We took the train to the Hotel de Ville (City Hall) en route to the cathedral of Notre Dame. This was the number one agreed upon highlight of our day in Paris. The cathedral is very imposing from the outside and had amazing stained glass windows. After a walk around the church and a few candles we walked toward Île Saint-Louis. We were diverted by several lock bridges and both couples did the touristy thing and hung a lock on the bridge and tossed the key into the river. Silly and charming all at the same time. Once arriving in Saint-Louis we found many small shops, some very commercial and some quaint where we did our part to boost the Parisian economy. We heard from some of our friends of an ice cream place that shapes the ice cream into flowers. I remember having gelato in Italy like that so we searched for the right place. Once we were done with our retail and confection moments we headed over to the Louvre. A walk through the Tuileries Garden on dry pebbly trails led us to the beautiful and massive museum..
Don’t you think Debbie is doing a wonderful job? We were pretty worn out by then so we wandered back to the subway, making our way to the hotel where we consulted with the concierge. She recommended a restaurant with a view of the Eiffel Tower. We ate at Chez Francis with a table on the busy street. The oysters to open my meal were very good. 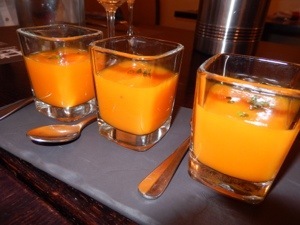 Each of us tried something different and enjoyed our selections. As the sun set and the city lit up, this is what we saw. After dinner we walked to the tower and took the elevator to the second level. I wanted to go to the top but they cut the line off right in front of me. Still it was a specacular sight and the perfect ending to an awe inspiring day. I guess I really was in Paris, wasn’t I? Today is the official beginning of our tour, French Waterways by #Tauck. I am here to say, Tauck is the best travel company you may have never heard of. Our happy plan began more than a year ago when a group of neighbors and friends decided to go on a European river cruise. I will always be grateful that one of them invited my husband and me. One very bright gentleman actually did a spreadsheet laying out many options offered by several reputable travel companies. Tauck won hands down because what you see is what you get. There are no additional upgrades/shore excursions/meal plans to purchase on the boat so everyone is on an equal keel. The rooms on the boat were slightly larger because they configure their boats for fewer guests. I will tell you more about the boat on Saturday. 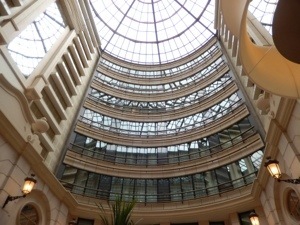 Today we checked out of our posh Marriott on the Champs-Elysees and checked into the tour hotel, the Hotel du Collectionneur. We sat in the lobby and watched as the many members of our tour arrived from the airport. I was very glad we flew in the day before. It really takes a day to get your legs under you. We gathered some of our group and walked a few short blocks to a corner cafe to get some breakfast/lunch depending on what time our body clock was telling. When we thought about ordering French Onion Soup we had a giggle. That order would be much like ordering Buffalo Wings in Buffalo at a restaurant restaurant. 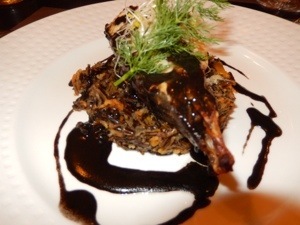 The food was fresh and well prepared except for the slow service we would come to expect throughout France. The other thing that took some “getting used to” was having to ask for the check. In Europe no one ever hurries you. Your table is yours forever if you do not ask. We see that as a lack of service while they intend it as the ultimate courtesy. Once again, very civilized! 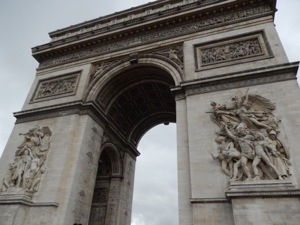 Upon return to the hotel our room was not ready so we headed out again for a walk to the Arch de Triumphe and with our own orientation yesterday we easily navigated to it. I have always loved the sounds of any city and European emergency vehicles have a sound unlike here in the USA. At every turn I felt like I was on a Hollywood set. We returned a while later and our room was ready. It was a large room by city standards and had all of the conveniences we are used to back home…actually, probably more! I think a room with a robe and slippers is so much fun. As we waited…and waited for our luggage to arrive my husband took a few minutes to relax. I became impatient and set off downstairs for a walk. I have never been uncomfortable walking in a city alone and Paris was screaming my name…in French, but of course. I wanted to have something sweet along with a cup of coffee. 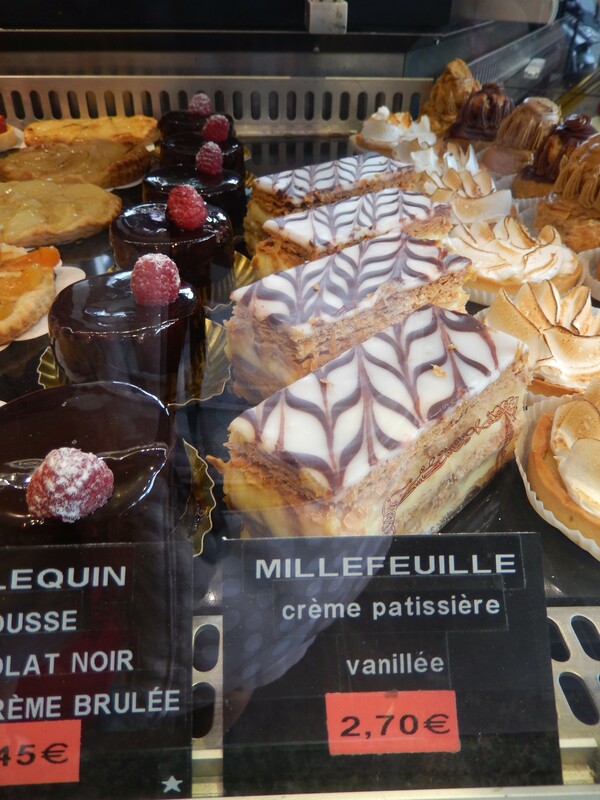 My wandering lead me to La Pain du Faubourg. The building was quaint with the promise of a Boulanger (baker), Patissier (pastry chef) and Traiteur (the keeper of a French or Italian eating house). What’s not to love? The pastry case was beautiful. I could not wait to try out my newly reacquired French. I would like a cup of coffee with milk and that beautiful pastry. I ordered the coffee well but stumbled with the pastry. I resorted to the usual foreigner tactic of pointing. I felt foolish but the server was polite and did not actually laugh in my face. I will be forever grateful for that. 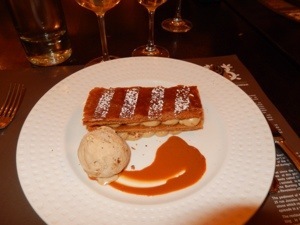 The pastry was called a millefeuille or what we call a Napoleon here. 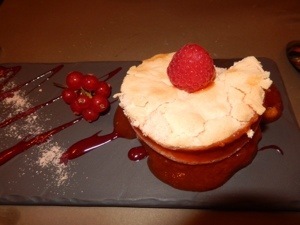 The cream was not overly sweet and was a good balance with the squint your eye sweet of the icing. 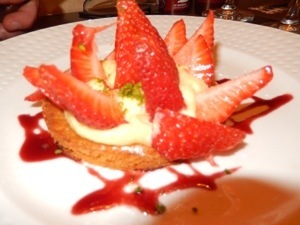 The pastry was crisp so either a bite or a fork would squish the cream all around. This was not neat to eat but I was not aiming for style points. My only regret was there were no tables out on the sidewalk to enjoy my confection. Even the packaging was pretty! Back to the hotel for me to find my bags waiting for me. 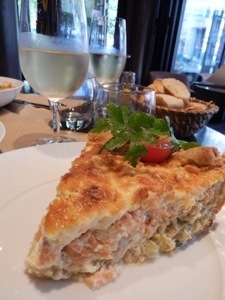 Time to prepare for our first dinner with the group at Fouquet’s, the famous restaurant on the Champs-Elysees to see and be seen. We filed up the elegant stairs to an upper room exclusive to our group where we were formally introduced to our tour directors. 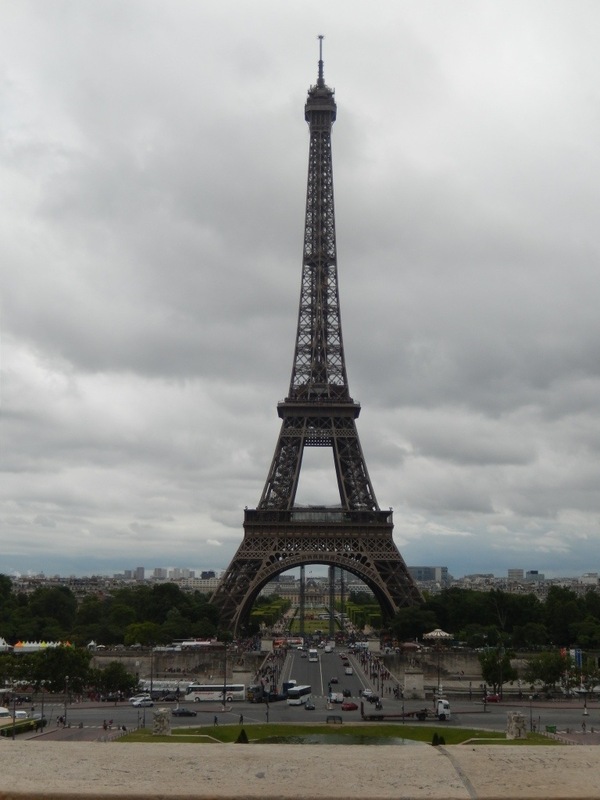 Each welcomed us to the iconic city or Paris with information about what to expect throughout the trip. We sat with a few couples who would then become our new traveling companions. It’s amazing how quickly you bond with people over French wine and delicious food. After dinner we boarded buses again for a nigh time tour of the City of Lights. We were introduced to a song familiar to some but not yet familiar to me called “Aux Champs-Elysees.” Click here for a cute YouTube version with very pretty photographs. 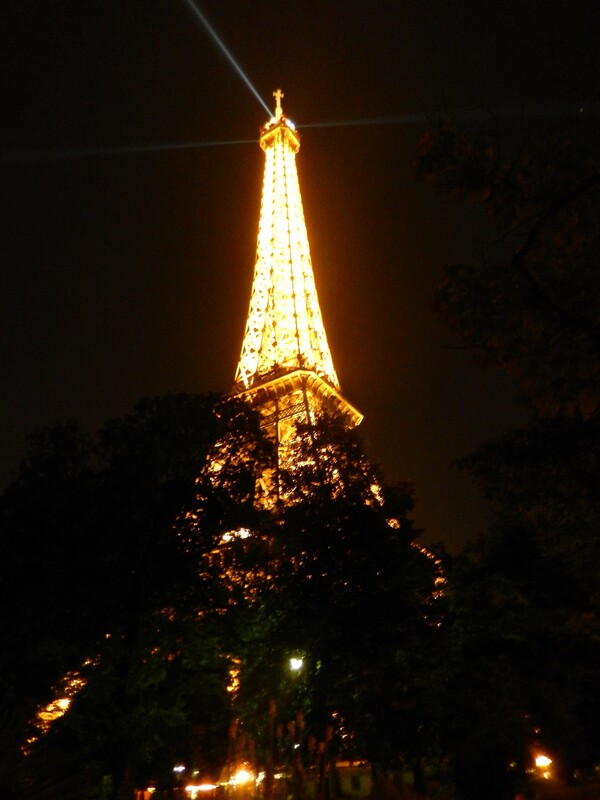 The bus brought us to the Trocadero where there is a perfect view of the Eiffel Tower. It was a long and wonderful day. The trip to the airport was uneventful. Our friend Bill drove us to Toronto so we didn’t need to park our car. Nice beginning. It was strange to not have a boarding pass prior to arriving at the airport. It took a minute to figure out how the kiosk worked but it was as simple as inserting my passport into the machine. These new fangled things are quite marvelous. Just as I experienced success a very nice man helped finish the job. Next, as we were getting our bags tagged we were offered a one day pass into the Air France Club and leaped at the opportunity. We arrived earlier for this flight than I have ever experienced before. Even after going through the international security process we had nearly three hours to board. There was tap beer, self serve which satisfied a few in our group. 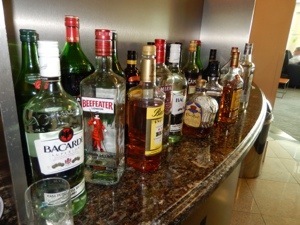 There was a fully stocked bar, soft drinks and even a cappuccino machine. Little sandwiches and a small salad bar took the edge off very well. Best of all there were comfortable cushiony chairs all along the bank of windows overlooking the international runway at the Toronto airport. We decided to save the business class fare and spend that money on things we will not be able to fit into our luggage on our way home. But, it’s a full plane. Will we regret that decision? There was a TV screen, like JetBlue, but not with live stream. It’s been a few hours now and getting used to French being the primary language is still a challenge to my ear. We are landing soon. All of the planning and anticipation is over and this real life adventure is underway.